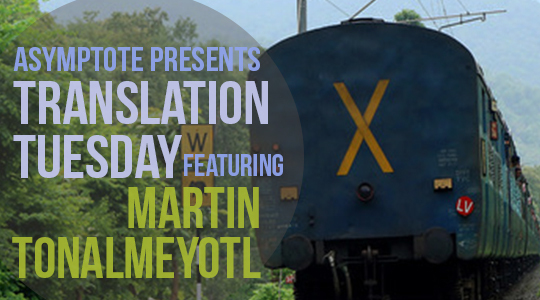 From the humorous to the profane and the sacred, Náhuatl poet Martín Tonalmeyotl’s poetic work is firmly rooted in the mountains of his native Guerrero (Mexico) and reflects his commitment to his culture and his language. Far from idealizing his home state, however, Tonalmeyotl’s work frequently takes an unflinching look at a sociopolitical situation where, in addition to the 2014 kidnapping and murder of forty-three students from Ayotzinapa amidst increasing violence from drug trafficking, Guerrero’s citizens have gone so far as to organize independent civil defense groups for protection. In “The Train,” the poet takes up another aspect of life in contemporary Mexico, human migration, in the series of freight trains otherwise known as La bestia (the Beast) or El tren de la muerte (the Death Train) that transport migrants from Central America to the US border.